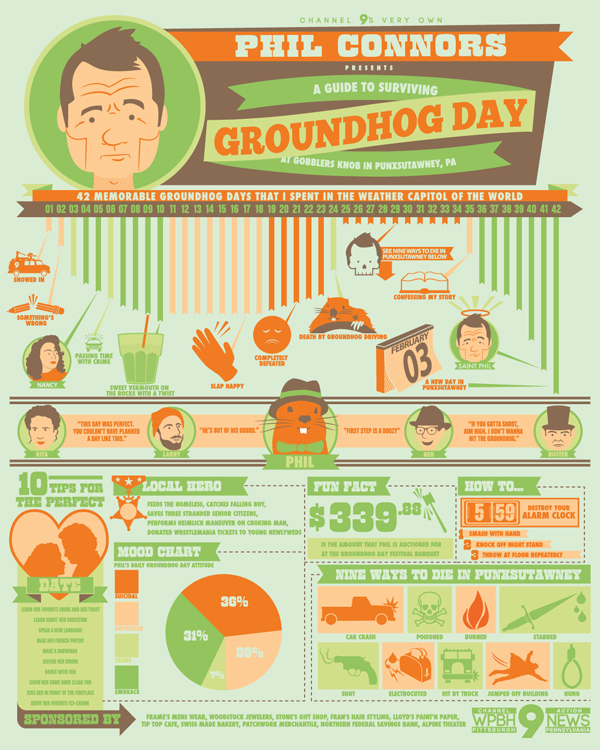 Here is a great Groundhogs Day infographic that was created by HERO. 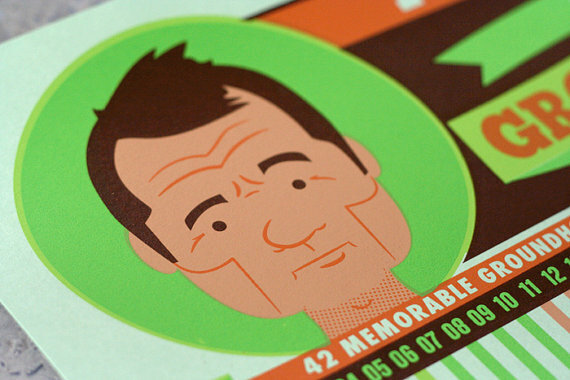 HERO is a multidisciplinary design studio dedicated to producing hand-crafted illustration and design, run by Long Beach, CA -based husband and wife team, Beth Manos and Mark Brickey (pictured above). Formed in 2003, Hero focuses primarily on design and illustration for the music industry and cultural institutions, yet have enjoyed collaborating on a wide range of projects for a variety of clients. Hero’s innovative screen prints have been featured in magazines such as HOW, Print, and SPIN, and design publications including Gigposters Volume 1: Rock Show Art of the 21st Century (Quirk Books), 1000 Garment Graphics (Rockport Publishers), and Naive: Modernism and Folklore in Contemporary Graphic Design (Gestalten Verlag). 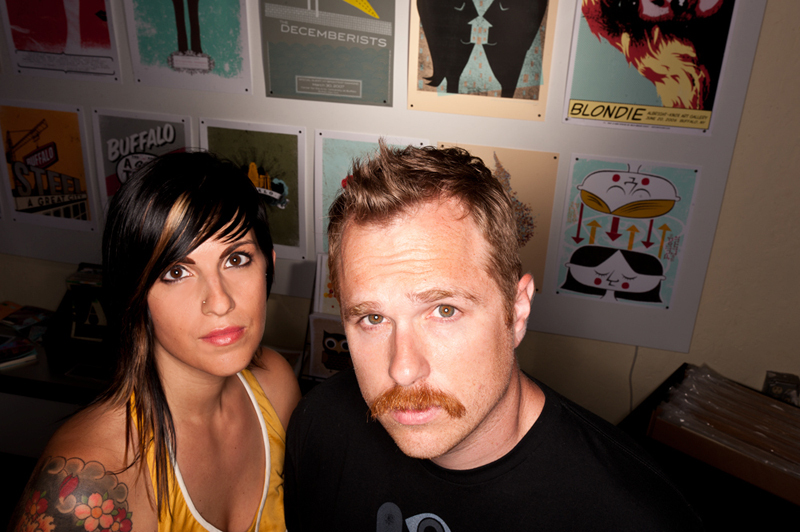 Their work has been exhibited in various museums and galleries including Museum of Design Atlanta, Gallery 1988 (LA), and Crewest Gallery (LA). 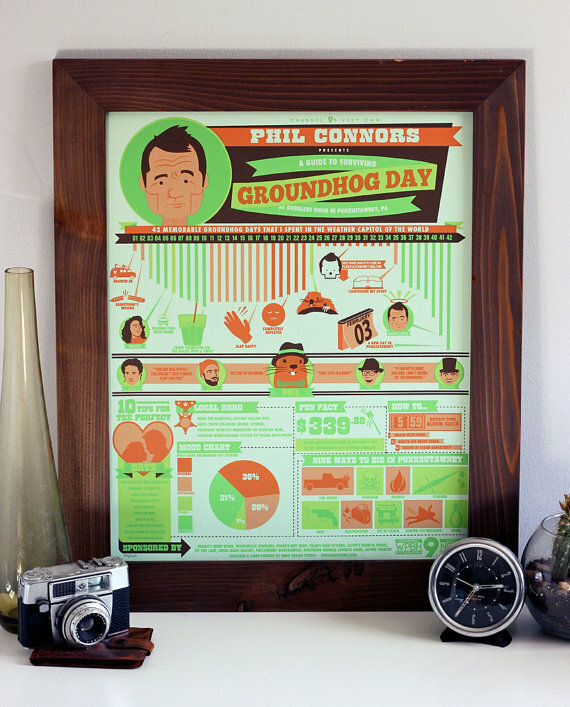 Hero created the infographic, below, titled “Phil Connor Presents: A Guide to Surviving Groundhog Day”. 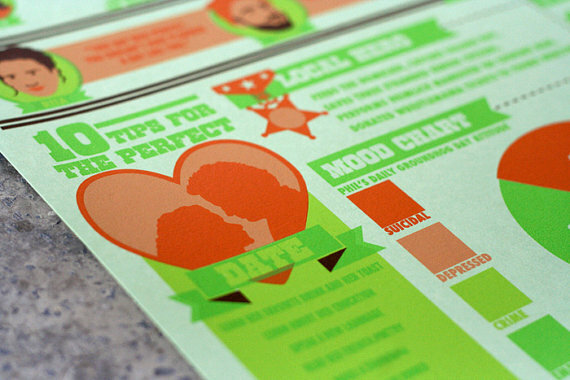 This infographic inspired print is a 16″x20″ 5-color silkscreen poster that is hand printed on 100# cover French Pop-Tone Paper in Spearmint. It is a signed edition of just 100 prints (unfortunately sold out). Update: 2:44pm – I just went to their direct Web site and they offer it for sale for $50. Here is the link and some images. 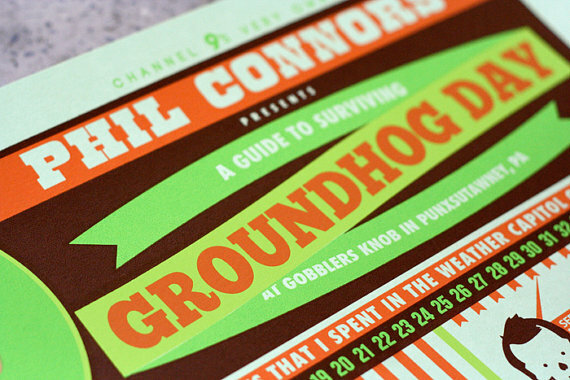 Groundhogs Day is one of those movies that regardless of at what point it is in the movie, if you see it on cable, you stop and watch the rest of it. So, Phil saw his shadow today and it looks like (at least) six more weeks of winter. I think folks living in the East side of the country probably feel they are living these cold days over and over too. Stay warm and Happy Super Bowl too.